Pixel Scroll 1/6/17 It Scrolls! It Pixels! It Makes Julienne Files! They [Galaktika] went on with publishing short stories without the authors’ permission, in this case the victims were Indra Das and Colin P. Davies. Davies knew nothing about this translation; but they asked Das for permission, but never got back to him with contract or the royalty. He did not know his story was published. Here is my article in Hungarian. (2) CINEMA DENIERS. New Statesman’s Amelia Tait, in “The Movie That Doesn’t Exist and the Redditors Who Think It Does”, reports there is an intense discussion on Reddit about people who say that they saw a movie called Shazaam in the mid-1990s with Sinbad as a genie, even though there is no evidence that this movie was ever made and Sinbad himself tweeted that “only people who were kids in the mid-90s” claim to have seen it. Tait says these redditors are probably mis-remembering Kazaam, a movie with Shaquille O’Neal as a genie from the mid-1990s. “I remember thinking Shaq’s Kazaam was a rip-off or a revamp of a failed first run, like how the 1991 film Buffy the Vampire Slayer bombed but the late Nineties TV reboot was a sensation,” says Meredith, who is one of many who claim to remember both Shazaam and Kazaam. Don remembers ordering two copies of the former and only one of the latter for the store, while Carl says: “I am one of several people who specifically never saw Kazaam because it looked ridiculous to rip off Shazaam just a few years after it had been released.” When Carl first realised there was no evidence of the Sinbad movie existing, he texted his sister to ask if she remembered the film. (3) ALL HE’S CRACKED UP TO BE. Another work of art from “Hugo Nominated Author” Chuck Tingle. (4) THE NEXT STEP. “Where do you get your ideas,” is an oft-mocked interview question, but how one writer develops his ideas is captured in Joshua Rothman’s profile “Ted Chiang’s soulful Science Fiction” in The New Yorker. Chiang’s stories conjure a celestial feeling of atemporality. “Hell Is the Absence of God” is set in a version of the present in which Old Testament religion is tangible, rather than imaginary: Hell is visible through cracks in the ground, angels appear amid lightning storms, and the souls of the good are plainly visible as they ascend to Heaven. Neil, the protagonist, had a wife who was killed during an angelic visitation—a curtain of flame surrounding the angel Nathanael shattered a café window, showering her with glass. (Other, luckier bystanders were cured of cancer or inspired by God’s love.) Attending a support group for people who have lost loved ones in similar circumstances, he finds that, although they are all angry at God, some still yearn to love him so that they can join their dead spouses and children in Heaven. To write this retelling of the Book of Job, in which one might predict an angel’s movements using a kind of meteorology, Chiang immersed himself in the literature of angels and the problem of innocent suffering; he read C. S. Lewis and the evangelical author Joni Eareckson Tada. Since the story was published, in 2001, readers have argued about the meaning of Chiang’s vision of a world without faith, in which the certain and proven existence of God is troubling, rather than reassuring. (5) BIG RAY GUN. The UK Ministry of Defence has awarded a ?30M contract to produce a prototype laser weapon. The aim is to see whether “directed energy” technology could benefit the armed forces, and is to culminate in a demonstration of the system in 2019. The contract was picked up by a consortium of European defence firms. The prototype will be assessed on how it picks up and tracks targets at different distances and in varied weather conditions over land and water. (6) CHOW DOWN. 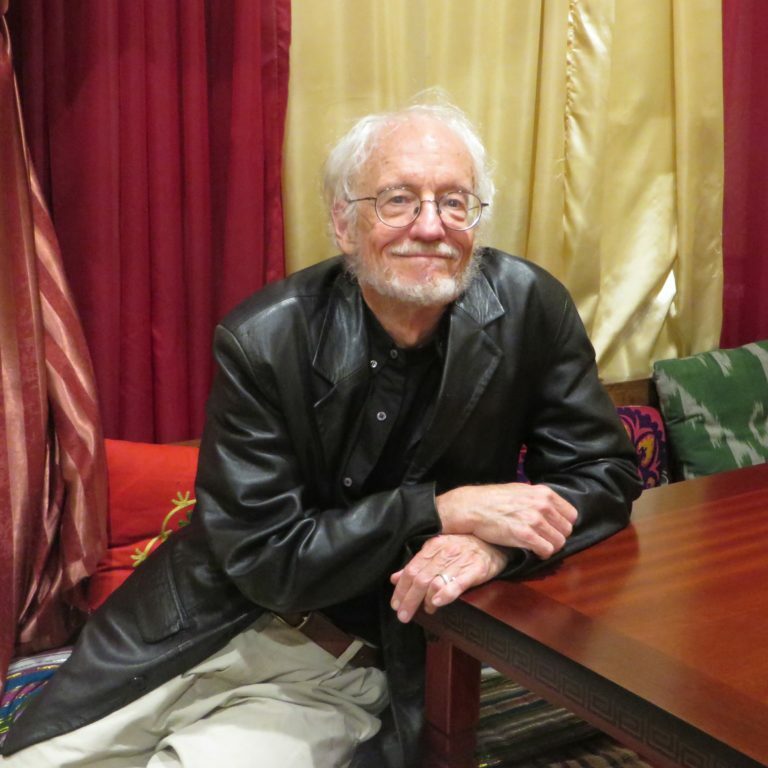 Episode 26 of Scott Edelman’s Eating the Fantastic podcast brings Edelman together with James Morrow at an Uzbek restaurant. We discussed his first novel (written when he was only seven years old! ), why he feels more connected to the fiction of Arthur C. Clarke than that of Robert Heinlein and Isaac Asimov, his many paths not taken, including that of filmmaker, the ethical conundrum which occurred after Kurt Vonnegut, Jr. autographed a book “for Jim Morrow, who writes just like me,” how Charles Darwin “confiscated our passports,” and much more. Edelman has launched an Eating the Fantastic Patreon. In order to make Eating the Fantastic even better, I’d like to pick up the pace, post episodes more often than biweekly, make day trips to capture writers whom I never get a chance to see on the con circuit, and maybe even upgrade to more advanced recording equipment. (7) AUTOGRAPH THE PETITION. Brad Johnson of Covina, CA has started a Change.org petition calling for California lawmakers to repeal the troublesome new standards for dealers in autographed items. (8) THERE IS A SILVER BULLET FOR THIS PROBLEM. Kate Beckinsale, star of Underworld: Blood Wars, joins Stephen Colbert to deliver an important werewolf-related public service announcement. (9) A STRANGE DEVICE. Seattle’s Museum of Popular Culture hosts “The Art of Rube Goldberg” beginning February 11. From self-opening umbrellas to automated back scratchers, if you can dream it, Rube Goldberg invented it. For more than 70 years, cartoonist Rube Goldberg drew unique worlds filled with inventive technology and political commentary. Equal parts clever satirist and zany designer, the Pulitzer Prizing-winning artist is best known for his invention drawings—complex chain-reaction machines designed to perform simple tasks. From iconic board games like Mouse Trap to thrilling music videos such as OK Go’s “This Too Shall Pass,” Goldberg has influenced some of the most indelible moments in pop culture. His name is so synonymous with his creations that it was added to the Merriam-Webster Dictionary as an adjective that describes the act of complicating a simple task. The tireless creator is thought to have drawn 50,000 cartoons over his long career. 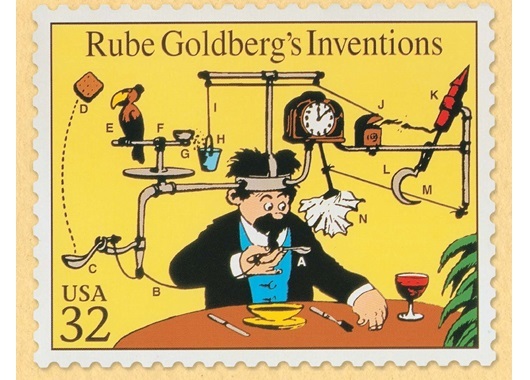 Today, Goldberg’s ideas live on through the Rube Goldberg Machine Contest. This annual international competition challenges teams of students to compete in building the most elaborate Rube Goldberg Machine. The Art of Rube Goldberg is the first comprehensive retrospective of Goldberg’s 72-year career since 1970. With more than 90 objects on display ranging from original drawings and animations to 3D puzzles, these incredible artifacts are paired with MoPOP’s signature interactive style to bring Goldberg’s imagination to life. (11) SPECIAL SNOWFLAKES. Anthony Herrera Designs has many patterns for science fictional paper snowflakes. The link takes you to the 2016 Star Wars set, and on the same page are links to Guardians of the Galaxy, Frozen, and Harry Potter designs. New characters! New vehicles! 50% more beards! It’s time for Rogue One: A Star Wars Story. These characters look just awesome and they make great snowflakes too. Here is the Star Wars snowflake collection for 2016. Featuring Rogue One characters and a few additional ones I just needed to throw in there. 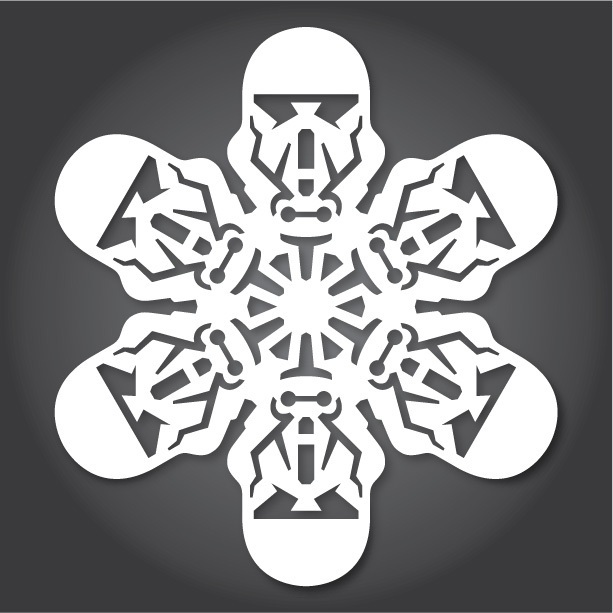 Download, cut and decorate with these snowflakes and most of all REBEL! This is an rebellion isn’t it? Unless your office coworkers will be annoyed. In that case be cool. Don’t be that guy. As always I recommend using scissors, a sharp x-acto knife and patience. Have fun! (11) THE SHAPE OF SHADES TO COME. Several File 770 readers have said they will be chasing the eclipse next summer. Here’s the latest information on where it can be viewed — “NASA Moon Data Provides More Accurate 2017 Eclipse Path”. On Monday, Aug. 21, 2017, millions in the U.S. will have their eyes to the sky as they witness a total solar eclipse. The moon’s shadow will race across the United States, from Oregon to South Carolina. The path of this shadow, also known as the path of totality, is where observers will see the moon completely cover the sun. And thanks to elevation data of the moon from NASA’s Lunar Reconnaissance Orbiter, or LRO, coupled with detailed NASA topography data of Earth, we have the most accurate maps of the path of totality for any eclipse to date. (12) MOON PICTURE. Annalee Newitz at Ars Technica says “Hidden Figures is the perfect space race movie”. Does the review live up to the wordplay of the headline? You decide! Johnson was part of a group of “colored computers” at Langley Research Center in Atlanta, black women mathematicians who were segregated into their own number-crunching group. They worked on NASA’s Project Mercury and Apollo 11, and Johnson was just one of several women in the group whose careers made history. If you’re in New York City on January 13th and 14th, illustrator and Visual Studies professor John Jennings will be debuting the graphic novel adaptation of Octavia E. Butler’s Kindred at the 2017 Black Comic Fest at the Schomburg Center for Research in Black Culture! Jennings collaborated with writer Damian Duffy on the project, and you can read a preview here. Is there anything more joyful than watching someone explain their passion to an appreciative audience? In the video below, Johnny Fraser-Allen walks Adam Savage through his gorgeously detailed model of the Labyrinth from, er, Labyrinth. Fraser-Allen began work at Weta Workshop straight out of high school, after being inspired to go into film by repeated viewing of Labyrinth and The Dark Crystal. Now he’s been commissioned by River Horse Games to create figures and illustrations for their Labyrinth tabletop game, and he gleefully shares his work with fellow maze-enthusiast Adam Savage, whose model of The Shining‘s iconic hedge maze is currently touring the country with the Stanley Kubrick Exhibition. See her post for the Youtube video about the Labyrinth maze. Meantime, here’s another video about Savage’s own Overlook Hotel Maze. The video is cued to when it’s all complete for about an 8-minute run, but people who want all the details on how it was designed and built can watch from the very beginning (24:21 total). (16) AWESOMENESS. Patrick Wynne, renowned mythopoeic artist, was thrilled with a gift he received from Carl F. Hostetter, one of his colleagues in the Elvish Linguistic Fellowship. It’s amazing what happens when your friends really know you. I think I might just have gotten my favorite Procasmas present EVER—a huge fleece throw with the infamous friendship portrait of Amy Farrah Fowler and Penny from “The Big Bang Theory”! 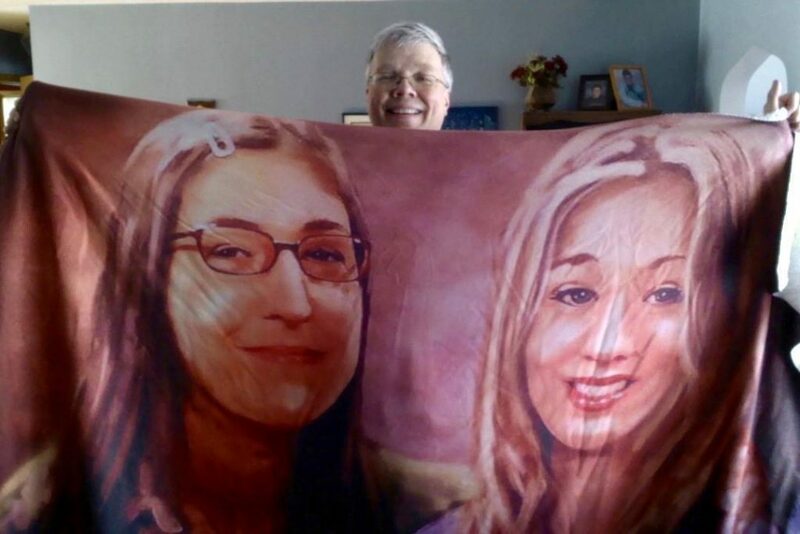 Thank you, Carl F. Hostetter, it’s wonderful! (17) INTERPLANETARY LOVE. The Space Between Us trailer #3 is out.